LED hose, flexible tube, 10m, RGB, 160LED LED light hose 220 VAC, RGB, 10 m long, 160 diodes and 8 lighting programs. 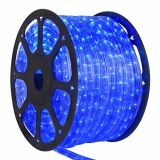 LED hose, 220VAC, 1,8W/m, blue LED hose 230 VAC, blue with minimum order segment 1 m.
LED rope, 220VAC, 3W/m, yellow LED Light 230 VAC hose, yellow with minimum order segment 1 m.
LED light rope, 220VAC, 3W/m, 36led/m, white LED 230 VAC light hose, white with minimum order segment 1 m.
List Price 4.60лв. VAT Incl. 4.37лв. VAT Incl. 4.14лв. VAT Incl. 3.91лв. VAT Incl. 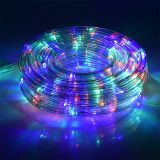 LED rope, 220VAC, 73led/m, blue Three-lane, 220 VAC, blue, flat 17 x 10 mm, transparent, two-row, 2 m segment. 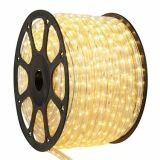 LED rope, 220VAC, 4.6W/m, 49leds/m, warm white Warm white LED rope with supply voltage 220VAC and 49leds per meter. Control for 10m LED rope Controller for LED hose 10 m long. Controller for external LED rope, 3-wire, IP44 Waterproof controller with power cord for the 3-pin LED rope. LED hose, 220VAC, 1.8W / m, 24LED / m, warm white LED light hose 220 VAC, warm white with minimum order segment 1 m.
Light tube power supply cable 0.8 m Power cord for lightening hose supply. List Price 3.40лв. VAT Incl. 3.23лв. VAT Incl. 3.06лв. VAT Incl. 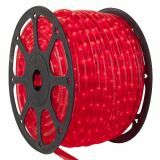 Power cable for LED rope, 240VAC-12VDC, 0.49m LED rope power cable 240VAC-12VDC, 0.49m.